Based on Store Street, Central London, The Building Centre was established in 1931. Crown Paints hopes its exhibit at The Building Centre will extend its services across the South East. The independent forum attracts approximately 2000 visitors every week to their architecture and design galleries. Crown Paints’ display will join the Product Exhibition space, which showcases the goods of 60 manufacturers across two floors. We are delighted Crown Paints has created a display here, said John Bonning, Commercial Director at The Building Centre. The Building Centre is a not-for-profit organisation, open to all interested parties involved in architecture and construction, as well as the general public, as a place to learn and develop knowledge about the built environment. 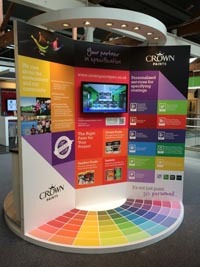 More information about Crown Paints display at The Building Centre is available on its dedicated website.